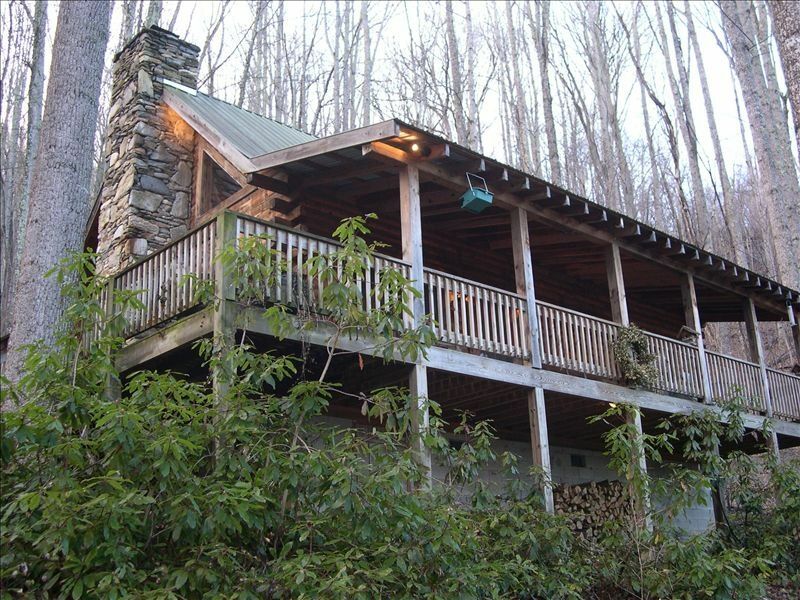 Discover the magic of the Smokies in this hand built, rustic log cabin perched on Eagle's Nest Mountain high above the quaint town of Waynesville. Enjoy our beautiful four and a half acre mountainside setting with pond, stream, seasonal gardens and mature hardwoods. The cabin, with its perfect location in a cozy, secluded setting, sleeps up to 4 people. Downstairs, the master suite has a queen-sized bed, roomy closet and attached bathroom with Jacuzzi tub/shower. Upstairs, the open loft has two double beds and bathroom with shower. Relax inside by the stone, wood-burning fireplace or outside in a rocking chair on the wrap-around porch. Additional amenities include a fully-equipped kitchen, TV/DVD, CD player/stereo (with speakers in the main room, master bedroom and front porch) and land line telephone. The recent addition of a fire pit behind the cabin adds further opportunity to relax. There is so much to do while you’re here. Explore the Great Smoky Mountain National Park, Pisgah National Forest or the Biltmore Estate. Ride and hike the Blue Ridge Parkway. Golf down the road at Laurel Ridge Country Club, raft the Nantahala, ski Catalouchee, ride horseback…or simply kick back and watch the traffic at the bird feeders. I was raised in New Orleans, where I still live, and attended summer camp in Western North Carolina. My wife and I purchased The Cabin on Eagles Nest along with our second residence in 2001 and we love spending as much time as possible in the mountains. We love Waynesville and its friendly people and we are only 30 minutes from downtown Asheville. We have a large garden, available for our guests to wander and enjoy, that keeps us busy when we are in the mountains. After gardening, it's time to relax and travel Western North Carolina. We especially enjoy sunsets at Water Rock Knob on the Blue Ridge Parkway just 15 minutes away. Bill’s cabin is wonderful! If you’re looking for a rustic cabin with all of the essentials and amenities, this is it! It is located close to stores/shopping yet feels remote. There is a creek next to the cabin which our kids loved! We also enjoyed the firepit and grill. The area is beautiful and you can hear so many birds right by the cabin. We even saw deer in the back of the cabin one morning. I would definitely recommend this property. The communication with Bill was also great and we really appreciate all of his help during our trip! Can’t wait to come back. Perfect cabin. Location, cleanliness, communication with the owners and plenty of kitchen ware, towels, etc. The fire pit is perfect and the fireplace and the porch are wonderful. The sound of the creek coming through the windows and the peaceful sounds of the woods were the absolute best. The master bed was so comfy and the sheets were so soft. The cabin is super clean and accessible to everything that the area has to offer. I will absolutely rent here again. Thanks Bobby and Bill! Wonderful mountain cabin- Rustic elegance- We loved the house, the location- very close to Waynesville but very private with a feeling of being remote. Our favorite area in of all the NC, Ga, Tn mountains. We will definitely return to this charming house. A very nice and cozy cabin. Great for a family. The way the cabin is situated gives you total privacy. The sound of the mountain stream is utterly peaceful. The large covered patio is perfect for rainy days. And the large wood burning fireplace makes it complete. Awesome! Good times perfect for a weekend ski trip to catalooche. Once again, we had a great stay at the Cabin, our home away from home. The best place to stay in Waynesville.